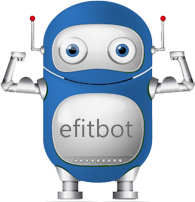 eFitBot (™) is our proprietary predictive analytics driven virtual fitness coach enabling trainers and their clients to target an optimum trajectory to be followed for endurance, strength, cardio and nutrition to achieve their fitness goals. eFitBot leverages extensive exercise classification, kinetic muscle group models, USDA database coupled with machine learning using trained models based on group and individual historic data. eFitBot provides the ability to fine tune and customize programs when paired with a real coach for optimum results. List of actual case studies (anonymized individual data for privacy) coming soon.